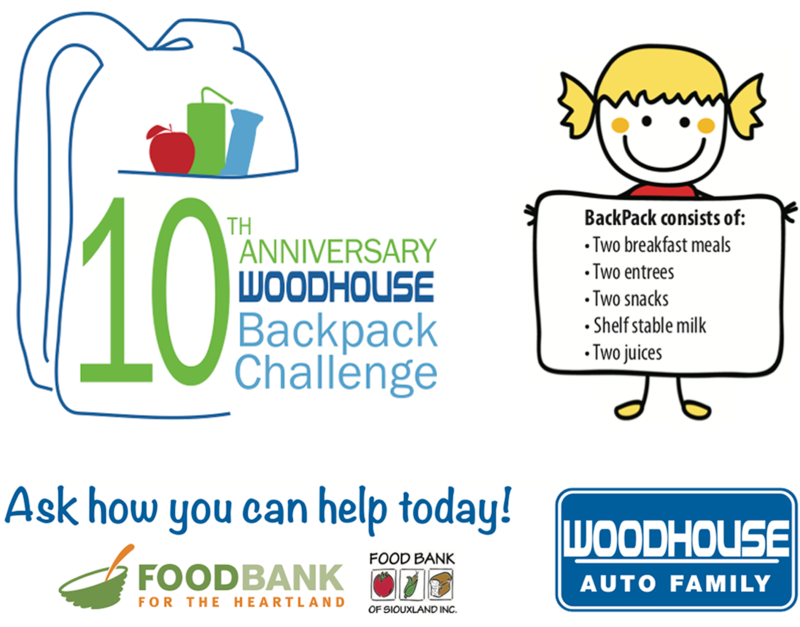 Woodhouse Auto Family continues its 10th year of supporting Food Bank for the Heartland and Food Bank of Siouxland Backpack programs, helping food insecure children across Nebraska and Western Iowa. Through Woodhouse Auto Family’s efforts, employee donations, and fundraising over the previous 9 years, we have helped to contribute over $6.6 million dollars to the program. Our unwavering support continues in the 10th year and beyond, as we help to ensure kids across our community are healthy, happy and hunger free. Hunger stops here. Donate a Backpack today. 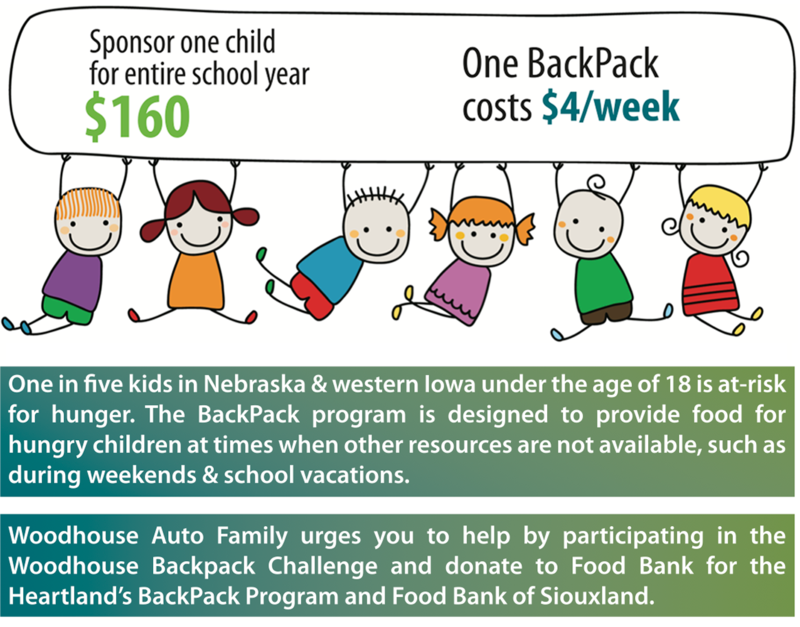 A $160 donation ensures a child in our community a Backpack with food for the weekend, and to show our gratitude for your participation, you also have the opportunity to attend our 3rd annual Woodhouse Celebration Concert. Every $160 donation qualifies you for two tickets to the "Make it Sweet" show on March 30, 2019, featuring Old Dominion and special guest Jordan Davis and Mitchell Tenpenny at CHI Health Center, while tickets last. Tickets and seating assignments are done on a first come, first serve basis. You will receive a reserved seat based on the time of your donation, so we are filling seats starting with floor and lower bowl and then continuing up into the upper bowl of the arena. We are unable to fulfill special requests on location or preferences of sections, or upgrades. We are able to provide handicap accessible seating, but seating is limited. Once you place your donation, please email marketing@woodhouse.com to request handicap accessible seating. If multiple donations are received from an individual at varying times, we cannot guarantee tickets together. You will receive your tickets through the mail at the mailing address you provided 4-6 weeks after the Food Bank receives your donation. Woodhouse Auto Family fulfills the processing of tickets ourselves to ensure the programs receive all of the money from your donation. Since you are receiving something in return for your donation, a $15 reduction in your donation will be assessed for each ticket received for tax purposes. The Food Bank’s will receive your whole donation amount towards the program, but you will only be able to write-off a portion of the donation for tax purposes. For instance, if you donate $160 and choose to receive tickets, you will only be able to claim $130 for tax purposes. It’s not our rule, it’s Uncle Sam’s. Please contact Woodhouse Auto Family directly through email at marketing@woodhouse.com if you have any addition questions. We will respond within 48 hours.